"This is like somebody having the scepter of an Egyptian king"
The wait for a new Wu-Tang Clan album has just taken a dramatic new turn. 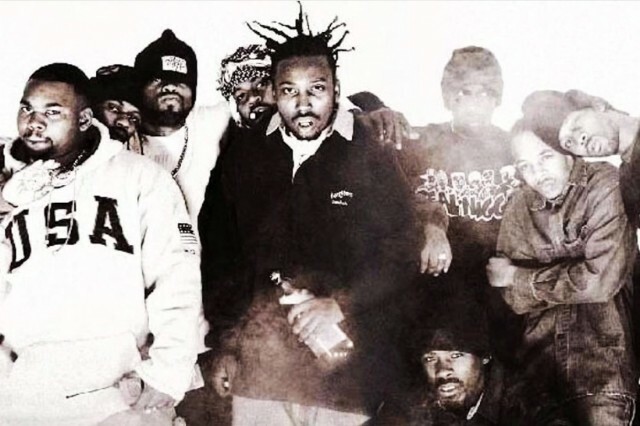 If all goes according to the most recently revealed plan, the rap group will manufacture and sell only one copy of a previously unannounced double album titled The Wu – Once Upon a Time in Shaolin. And the Staten Island, New York hip-hop legends will be asking for a multimillion-dollar price befitting a unique work of art. Wu-Tang reportedly want to restore music’s place as art. The single copy of Once Upon a Time in Shaolin will crisscross the world’s museums, galleries, and festivals on a tour, just as a work art might, according to Forbes.com, which cites RZA and co-producer Tarik “Cilvaringz” Azzougarh. Heavy security and special headphones will guard against piracy. Dates for the exhibitions have yet to be announced. After the tour is over, Wu-Tang will sell the album — if we’re lucky, to a wealthy benefactor who will keep it available for the rest of us. The news puts a different twist on Jay Z’s declaration of “new rules” when he teamed up to release Magna Carta Holy Grail through Samsung last year. And Once Upon a Time in Shaolin is not to be confused for Wu-Tang’s long-gestating new proper album A Better Tomorrow. First expected as early as last July, that LP is now reportedly set to arrive “this summer,” in the new old-fashioned way. Below, read a note about the release from RZA and Cilvaringz, posted on what Forbes.com flagged as the project’s website. History demonstrates that great musicians such as Beethoven, Mozart and Bach are held in the same high esteem as figures like Picasso, Michelangelo and Van Gogh. However, the creative output of today’s artists such as The RZA, Kanye West or Dr. Dre, is not valued equally to that of artists like Andy Warhol, Damien Hirst or Jean-Michel Basquiat. Is exclusivity versus mass replication really the 50 million dollar difference between a microphone and a paintbrush? Is contemporary art overvalued in an exclusive market, or are musicians undervalued in a profoundly saturated market? By adopting a 400 year old Renaissance-style approach to music, offering it as a commissioned commodity and allowing it to take a similar trajectory from creation to exhibition to sale, as any other contemporary art piece, we hope to inspire and intensify urgent debates about the future of music. We hope to steer those debates toward more radical solutions and provoke questions about the value and perception of music as a work of art in today’s world. While we fully embrace the advancements in music technology, we feel it has contributed to the devaluation of music as an art form. By taking this step, we hope to re-enforce the weight that music once carried alongside a painting or a sculpture. The album will be put on listening display in renowned galleries, museums, venues and exhibition spaces around the world for only the most dedicated to experience before it disappears into the private collection of a buyer. The public will know that what they will hear will be a once in a life time experience.